UICC 08: Luk Joossens and the Tobacco Control Scale: how does your country rate on tobacco control? The mot recent report about the Tobacco Control Scale in Europe in 2016 (pdf format) lists 30 European countries. For all the information about UICC 08, visit our conference blog. Here is the presentation given by Karen Slama in Cape Town during the 38th World Conference on Lung Health organized by the International Union Against Tuberculosis and Lung Disease. Here is the presentation given by Patricia Lambert in Cape Town during the 38th World Conference on Lung Health organized by the International Union Against Tuberculosis and Lung Disease. Here is the presentation given by Sinead Jones in Cape Town during the 38th World Conference on Lung Health organized by the International Union Against Tuberculosis and Lung Disease. Here is the presentation given by Judith Mackay in Cape Town during the 38th World Conference on Lung Health organized by the International Union Against Tuberculosis and Lung Disease. Here is the presentation given by Yussuf Saloojee in Cape Town during the 38th World Conference on Lung Health organized by the International Union Against Tuberculosis and Lung Disease. David Sweanor is adjunct professor with the Faculty of Law of Ottawa University. He is a former legal counsel of the Non Smokers Rights Association. Guido Palazzo is assistant professor at the University of Lausanne. He specializes in business ethics. Anna Gilmore: The Future of BAT: World Leader or Also-Ran, Paragon or Pariah? Anna Gilmore is with the London based European Centre on Health of Societies in Transition. It so successfully turned people off smoking in the 1980s, the tobacco lobby tried to have it banned. Jonathan explains to Cecilia his arguments in favor of a harm reduction strategy. Our podcaster extraordinaire at the Basel Conference, Cecilia Farren interviews Constantin Krasowsky (from Ukraine). She also took his picture. 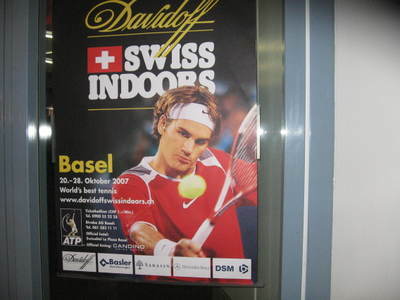 Pascal Diethelm aks all the conference participants to sign the petition to protest the sponsorship of the Basel International Tennis Tournament by Davidoff and ask Roger Federer not to let use his picture in connexion with Davidoff: while he is a Unicef Ambassador, the Davidoff brand is used by Imperial Tobacco to promote smoking in many countries, especially less privileged ones. China: Broadcasting watchdog to limit smoking scenes in movies and TV series. CHINA'S broadcasting watchdog has decided to intensify the supervision on smoking scenes in movies and TV series. #399 The Lancet: Adding harm reduction to tobacco control. Ireland: Smoking ban good for music instruments. Scotland: More women dying of lung cancer. Nicotine Addiction Can Happen Quickly, Researchers Say. Western Australia: Don't smoke at home or in your car. Toward a smoking ban on the Joondalup's beaches (in Western Australia). Big Daddy Smoke on New York: Cigarettes are eating you alive. 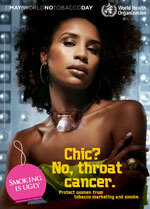 Evelyn Wangari on Scotland: More women dying of lung cancer. phone cases for galaxy s3 on Nicotine Addiction Can Happen Quickly, Researchers Say. cases for the samsung galaxy s3 on Nicotine Addiction Can Happen Quickly, Researchers Say.